The pale orange butterfly fluttered from flower to flower, unaware that Alexander, a small gray kitten, was watching its every move. He hid behind a cluster of sweet smelling violets, ready to pounce at the butterfly. He watched intently as it landed on a pale yellow rose. Its antenna waved in the gentle breeze and its wings moved back and forth as it sipped nectar from the flower. Alexander jumped up from behind the violets and landed right in the middle of the rose bush. The thorns poked into him. He let out a very loud MEOW and wriggled himself free from the bush. He lay in the dirt as the butterfly flew away. He stood up and ran home to his mother and the other kittens. His mother licked Alexander’s wounds clean, scolded him, and sent him back out to play. It had only been a few days since Alexander had been allowed to leave his mother’s side, but now he was able to go anywhere he wanted, which was wonderful, as long as he could run back to his mother in a short time. Alexander fluffed up his fur and went on his way. He ran through the dirt and soon came to a large rock. He stopped to look at it and saw a caterpillar inching its way through the tall grass that grew along the dirt path. It was wiggling its body up and down as it moved. Alexander moved in for a closer look. The caterpillar didn’t seem to mind the intrusion. It continued on its way. Alexander bent down and sniffed it. It stopped just for a moment and then kept going. Alexander lost interest quickly and ran off towards the giant willow tree that provided shade for him and the other kittens during the heat of the day. At the bottom of the tree was a mound of dirt. Alexander watched some ants going in and coming out of a hole at the top. He looked at the ants, as they seemed to be carrying bits of leaves and food they’d probably picked up at a nearby picnic. Alexander took his paw and stuck it in the hole. He scratched it with his tiny, but sharp claws, and made the hole larger. Within seconds hundreds of angry ants came pouring out and started biting Alexander’s paw. He jumped back but there were so many ants that when he jumped backwards, he landed in the middle of more of them. Soon he was covered from head to toe in black ants. They nipped him. He shook his fur. Some flew off but there were still many clinging to him. He ran as fast as he could around the tree, and then around the rose bush, and then he ran down the dirt path. Most of the ants fell off, but not all. Meowing as loudly as he could, he ran home to his mother. 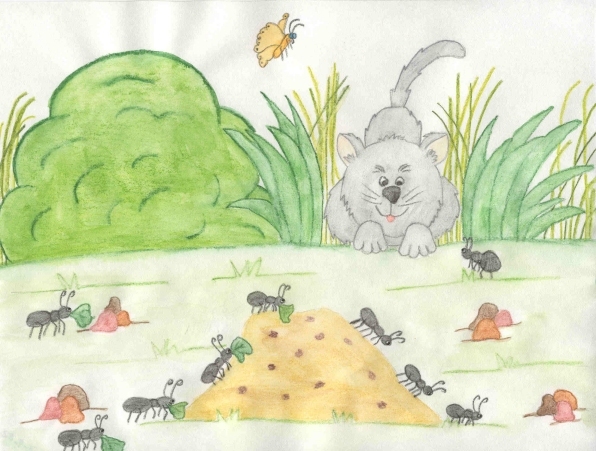 When she saw all the ants crawling on Alexander, she used her paw and brushed them off her kitten. She scolded Alexander and sent him on his way, but reminded him to be careful and stay out of mischief. Alexander walked slowly down the path, being very careful to watch for ants crawling along in the dirt. He rounded a bend and saw a tortoise. It was standing still. Alexander crept towards it. The tortoise still didn’t move. He went right up to it and sniffed it. The tortoise didn’t like Alexander’s whiskers tickling its nose so it pulled its head into the shell. Alexander moved backwards. Where did the tortoise’s head go? He couldn’t see it anywhere. There stood a shell with four legs and no head. He sniffed the hole where the head went in. Suddenly the shell dropped to the ground and all four legs disappeared into the shell. Alexander was confused. He nudged the shell with his paw. It moved. He rocked it around in circles. After doing this for a while, he tired of the game and left. No sooner had he gone back around the bend than the tortoise’s neck, head, and all four feet came back out of the shell and it walked away. The sun was beginning to set. Alexander hurried home to his mother. All the other kittens were there too. Mother licked them gently and rubbed her body against theirs. Alexander snuggled up against her neck and fell asleep. What new and exciting adventures awaited him the next day?